When you’re eye-crossingly busy getting the kids from one activity to the next after putting in a full day’s work, it can be tough to get a healthy meal on the table. Fast food is everywhere, and it’s tempting to hit the drive-thru because it makes filling little bellies super quick and convenient. While fast food isn’t always the healthiest option, it doesn’t have to be the worst, either. You have a choice as to whether you pick the fatty No.1 or a healthier item on the menu. 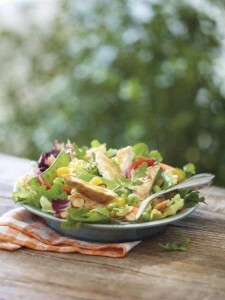 McDonald’s Asian Chicken salad is back on the menu, giving customers a healthy meal option under the golden arches. With grilled chicken, the salad clocks in at just 360 calories. And while it’s great that it’s a low-cal meal, I found it to be too low-cal when I tried it a few years back—I was starving just an hour later. When McDonald’s sent me a voucher to try it this go-round, I was prepared: I added a Fruit ‘N Yogurt Parfait, which with 160 more calories gave the meal enough sticking power to tide me over until dinnertime. The salad was actually quite fresh and tasty, with about three cups of crunchy veggies including edamame and snow peas, red bell peppers and sweet mandarin oranges, as well as sliced, toasted almonds. The low-fat sesame ginger dressing is just right for this salad—sweet but not too sweet and it doesn’toverpower the veggies. The salad isn’t perfect with its rockin’ amount of sodium (600 mg before you add another 410 for the dressing), but in the fast food world, it can always be worse. Sure, in a perfect world we’d only serve our kids organic foods we made at home. But let’s be real—sometimes that’s just not an option. So instead of beating ourselves up about occasionally getting fast food, let’s just make better choices when we do!